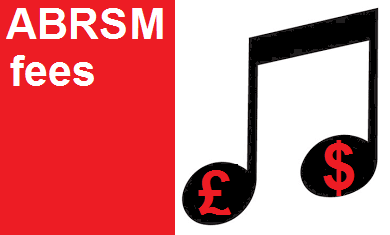 ABRSM fees - are they value for money? This Friday, 19th January 2018, is the UK online closing date for ABRSM exams and as I was getting the necessary information I needed for entering this terms students, I noticed as usual that the ABRSM fees have gone up again between £1 and £3 depending on the grades. I then decided to dig a little further to see how much they have risen over the last six years and as this table shows, there has been an increase of between 14% to 19% over this time period. For some grades this is about twice as much as wages have increased over the same time period. Of course these are figures for the UK so feel free to leave a comment about increases in the fees for other countries in the comments below. So do these exams offer good value for money. Have ABRSM exams become elitist only available to those from well off families? And where does the money go? Then I conducted a poll on my YouTube channel and as of writing this post 55% of you thought that the ABRSM exam fees were extortionately overpriced . Of those who belong to the 45% who consider the fees good value for money, a couple of comments made interesting reading. The money, is miserable; you earn more washing up in a hotel kitchen. non-profit organization (NPO) whose primary objectives are philanthropy and social well-being (e.g. charitable, educational, religious, or other activities serving the public interest or common good). Now call me cynical, but although ABRSM is technically non profit making, it doesn’t have fat-cat share holders, my idea of a charity, even if not exactly the legal definition of one, is an organization, that promotes the welfare of others, expressed by the donation of money to good causes. OK the ABRSM does award to a lucky few free scholarships to study music, but pricing worse off families out of taking their exams seems somewhat contrary to the principle of a charity. Added to this charitable organisations, are eligible for reliefs and exemptions from taxation in the UK. such as income tax, capital gains tax, inheritance tax, stamp duty land tax and value added tax. How convenient. So which side of the fence do you fall? Having heard more than maybe you previously knew, do you think that ABRSM exam fees are good value for money? Please leave a comment below. I've been using the Associated Board for music exams since 1997, and have a real problem with the cost and year on year increases in exam fees. £40 now, for a 12 minute Grade One exam. And, as you mentioned, they are a charity. But we don't get anything from them, that doesn't cost more money. We even pay them for our pupils to do the Music Medals, but we do all the work. All they give is a little badge, and a certificate. The ABRSM should be classed as a business. As far as I'm concerned there's nothing charitable about them, whatsoever.